The history of Earth is marked by at least seven major mass extinctions, including asteroid impact effects 580 million years ago, the end Ordovician glaciation, late Devonian asteroid impacts, end-Permian volcanism and ocean anoxia, end-Jurassic volcanism and Cretaceous-Tertiary asteroid impact—mostly associated with an extreme rise in atmospheric CO2. Currently the seventh mass extinction of species is taking place, mainly as a consequence of CO2rise at a rate close to that induced by an asteroid impact (Figure 1). The Seventh mass extinction is triggered by a species which harnessed transfer of carbon from the Earth’s crust to the atmosphere and has split the atom, but is failing to control the consequences. Such is the scale and the rate of the unfolding climate catastrophe that, in the words of Joachim Schellnhuber, the EU’s chief climate scientist, it threatens the life support systems of the planet. As extreme weather events are killing and injuring hundreds of thousand people and a huge numbers of animals in parts of the globe (https://newrepublic.com/article/121032/map-climate-change-kills-more-people-worldwide-terrorism), the origin of these developments is largely covered-up by the mainstream media. Petty issues are endlessly propagated by the press and in parliaments. It is business as usual among the privileged minorities, emitting carbon at accelerated rates as they drive and fly around a warming world. Figure 1. 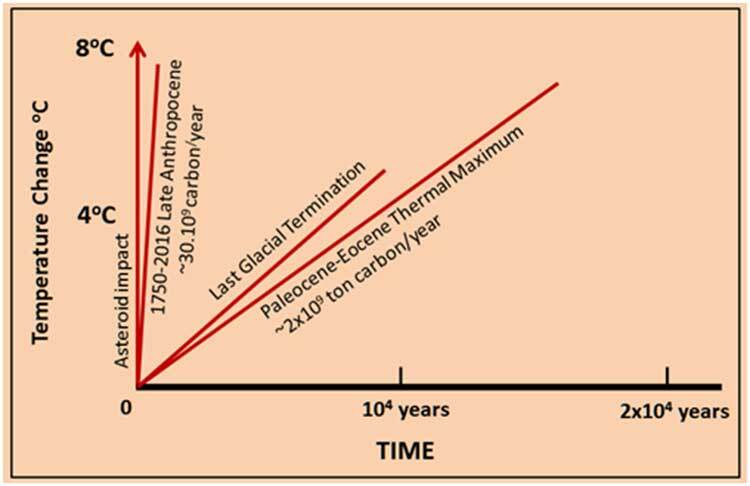 Comparison of the rate of temperature rise between (1) the last glacial termination (14,000 – 11,500 years ago); (2) Paleocene-Eocene thermal event 56 million years ago; (3) 1750-2016 AD Anthropocene event; (4) asteroid impact. With this perspective, the ignorance of the majority, enhanced by vested interests-controlled mainstream media, and the criminality of atmosphere-polluting lobbies, may only become clear when survivors finally comprehend the loss of large parts of the habitable Earth. With this perspective the political furor over the difference between 26 percent and 50 percent reduction in emission favored by the different parties is meaningless, since neither target can prevent the amplifying CO2 feedbacks from continuing to warm the atmosphere, land and oceans (http://www.anu.edu.au/news/all-news/earth-at-risk-of-entering-a-hothouse-climate). In true Orwellian Newspeak fashion, the “powers to be” have changed the language, from “climate change” and “global warming” to “electricity power prices”, namely from the future of live on Earth to the hit pocket nerve, a Faustian Bargain which underpins the sacrifice of future generations and much of nature. The Seventh mass extinction does not rise exclusively from global warming, and can be brought about, separately or in combination, by design or accident, through the probability of a global nuclear cataclysm. As time goes on, this possibility becomes a probability and inevitably a certainty, an increasingly likely prospect on a warming planet burdened by resource wars. The hapless inhabitants of planet Earth are given a non-choice between progressive global heating and the coup-de-grace of a nuclear winter. From the Romans to the third Reich, the barbarism of rich empires surpasses that of small marauding tribes. It is mainly among the wretched of the Earth that true charity is to be found, where empathy is learnt through suffering. What is now occurring in North and South Carolina is a call for Americans to face an existential reality. It is a reality based on scientific fact. Will there be a meaningful US national response? Doubtful. We are living on the cusp of the possibility of a planetary extinction. High temperatures throughout the planet caused by the emissions of Carbon Dioxide and Methane could have the totality of emissions during the Permian Triassic. This warning goes back to 2012 when the World Bank warned of the possibility of a Methane Hydrate Feedback Loop occurring in the Arctic that would bring on another Permian Triassic kind of planetary extinction event. Even if we can avoid that totality, our legacy to future generations as a result of rising temperatures on the planet will be the death and suffering of billions. Any form of discussion must start with our fossil fuel dependency as the major cause of the problem. The only solution is a transnational 100% Death Tax on those in control of the fossil fuel industries. Many thanks David. We are on the same page.